I have a terrible confession to make: I don’t hate “Jeremiah Crichton.” Indeed, when I watched the show for the first time late last year, I actually rather liked this episode. 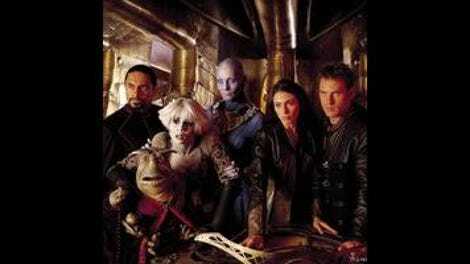 “Jeremiah Crichton” is infamous as Farscape’s worst episode ever, although I don’t think it’s quite that bad. Certainly, this is the worst episode we’ve dealt with so far, and it’s not just that the story doesn’t work, the guest performances range from bland to poor, and the general look of the episode is ridiculous, whether it’s the natives’ bright purple getups or Crichton’s hilariously fake beard. Those are all serious problems, but they wouldn’t necessarily spell doom for an episode all by themselves; “Thank God It’s Friday, Again” had similar problems, albeit not nearly to the same extent as “Jeremiah Crichton.” Still, that earlier episode generally worked because it understood its main characters and because it adopted such an aggressively weird, irreverent tone. Precious little of that is on display here, and while the episode eventually finds some moderately interesting things to say about Rygel, it’s a long, frequently tedious slog to that point. In fairness, the episode does start promisingly enough. Crichton having a complete breakdown onboard Moya is a notion worth exploring, and it’s a great touch to have him snap at Zhaan when she doesn’t understand the idiom “fed up,” as he angrily observes that this sort of thing that was cute the first six billion times it happened. The opening presents a very understandable flashpoint for all of Crichton’s frustrations, as he finds himself crammed into a tiny hatch, making difficult, disgusting repairs to the pregnant Moya while a particularly tetchy D’Argo berates him. It’s not entirely clear why Crichton’s anger extends to Aeryn, but it’s easy to speculate that their experiences in “The Flax” left plenty of unresolved tension and awkwardness; besides, the constant insults and putdowns must take their toll eventually. Moya’s sudden, unplanned starburst while Crichton is out blowing off steam in his module leaves the human even more stranded than he was before. That’s a great hook for an episode, and there’s no end of potentially great ways in which the show could have explored Crichton’s sudden isolation. Until the big Rygel reveal, all the episode offers by way of story is the power struggle between Kato-Re, the Acquarans’ Grondeer, and Neera, the high prieston, and the love triangle between Crichton, Kato-Re’s daughter Lishala, and Neera’s son Rokon. None of that is terribly inspiring, but even that could perhaps have worked if not for the fact that Crichton doesn’t want anything to do with the tribe. He wants to live like a hermit, he tells Kato-Re he has no plans to interfere, and he has nothing but platonic affection for Lishala. Because Crichton keeps trying to extricate him from the story, the guest characters can only interact with each other, and much like the Delvians in “Rhapsody In Blue,” that makes for a lot of stilted, emotionally dead exchanges, and the tribe comes across more as embarrassed coworkers forced to endure a mildly tense work retreat than primitives locked in life-or-death struggles. Nobody gives a good performance here—as Kato-Re, John O’Brien comes the closest, but he doesn’t convey much beyond bland decency—although it’s hard to fault the actors too much when they are given nothing to play. Deni Gordon plays Neera as a scheming, dastardly villain, but her over-the-top approach seems especially silly when the episode provides no sense of why any of her plotting matters, least of all to Crichton and his shipmates. And while Natalie Mendoza does nothing with her part, Lishala is by a wide margin the worst character Farscape has presented; if you can name a single personality trait she displays over the course of the episode, you’re ahead of me. At the outset, I said that I almost liked “Jeremiah Crichton” when I first watched it. The reason for that is that, much as how “I, E.T.” was Farscape trudging through Star Trek: The Next Generation territory, this episode feels like a pale imitation of old-school Doctor Who, something I have an admitted weakness for. The classic series regularly made stories about primitive cultures engaging in bizarre power struggles, which often involved theatrical performances, clunky exposition, and deeply unconvincing costumes and sets, and they often managed to be excellent in spite of all those limitations—the Peter Davison classic “Kinda” is maybe the best example of this form, though there are plenty of other examples. However, those stories generally have a much clearer sense of story and world-building than “Jeremiah Crichton” has, and they feature a main character in the Doctor who actually wants to understand and help this alien culture. Such stories aren’t nearly as good a fit for Farscape, as Crichton—even when he displays more intellectual curiosity than he does here—always has his own agenda and isn’t interested in solving some other people’s problems. I didn’t even mention my very least favorite part of the episode, which is its treatment of Zhaan. “Jeremiah Crichton” tries to follow on from the events of “Rhapsody In Blue” by suggesting Zhaan has become colder and harsher, but outside the one scene where she argues they should abandon the search for Crichton after three fruitless months—which, honestly, is a pretty reasonable amount of time by any standard—neither the script nor Virginia Hey’s performance suggests this version of Zhaan is any different from the one we have spent time with in any other episode. Farscape is generally good about showing rather than telling when it comes to character development, so this feels especially egregious. As mentioned in the review, the commentary for this episode is highly recommended — entitled “When Bad Things Happen To Good Shows,” it features creator Rockne S. O’Bannon, showrunner David Kemper, and stars Ben Browder and Claudia Black mercilessly deconstructing everything that went wrong with the episode. As such commentaries go, it’s second only to Ron Moore’s self-eviscerating podcast for the Battlestar Galactica episode “Black Market,” which is a way, way worse episode of sci-fi television than “Jeremiah Crichton.” Anyway, you can check out a transcript of the commentary here, in case you don’t have the DVD or Blu-ray. Fine, one more terrible confession—when I first watched “Jeremiah Crichton,” I didn’t notice that the beard was fake. Perhaps this has something to do with my own inability to grow one, but that’s hardly an excuse; as Ben Browder points out on the commentary, that is one immaculately groomed and straightened beard for a guy who is supposedly living a mountain man’s life. “Durka Returns” feels like both a culmination of one story and the beginning of another. A sequel of sorts to “PK Tech Girl,” the episode reveals the true fates of both the Zelbinion and its captain, Selto Durka. His survival as a mind-cleansed servant of the technologically advanced, conformity-obsessed Nebari is the big twist that opens the episode, but it’s just one of several ways in which the episode defies expectations. Three guest characters come aboard Moya in this episode: one who Rygel has met before, one who we only know briefly, and one who ends the episode as the newest member of our band of fugitives. Neither Durka, Salis, nor Chiana is easily categorized as good or evil—well, it soon becomes clear that none of them are good in any straightforward sense, but the real question is whether any of them can be trusted. These are possibly the three best characters Farscape has come up with since the main cast was introduced way back in “Premiere,” and their interactions both with the crew and with each other yields an episode that is every bit the towering success that “Jeremiah Crichton” isn’t. At the risk of giving away a rather basic spoiler, there’s going to be plenty of time in future reviews to discuss Chiana, but it’s still worth praising the work Gigi Edgley does in her debut episode. Her off-kilter line readings and body language mark her as an alien presence along the same lines as Matala in “Back And Back And Back To The Future” or Volmae in “Thank God It’s Friday, Again,” but Edgley doesn’t just play Chiana as weird and otherworldly; she also incorporates more straightforward line readings that indicate her desperation when threatening Rygel or her anxiety when failing to lure Durka into the chamber. Everything about Chiana—Edgley’s performance, Grant McAloon’s script, and Tony Tilse’s direction, which repeatedly places Chiana and Crichton in each other’s personal space—marks her as an alien seductress, but there’s also a clear sense of the psychological damage lurking just beneath the amoral, hypersexual exterior. “Durka Returns” never allows the audience to get comfortable with Chiana, and every time it seems like she might be deserving of Crichton’s—and, by extension, our—trust, the story twists once more, including the devastatingly ambiguous final exchange. Still, Chiana wouldn’t be nearly as effective if the Nebari in general weren’t so well-drawn. Their monochrome appearance is Farscape’s most memorable alien design since the Luxans and the Delvians, and the gray complexion is the perfect aesthetic complement to the Nebari’s fixation with emotional balance and conformity. The script quickly establishes the Nebari as a serious threat with Salis’ offhand remark that the Nebari ship that destroyed the Zelbinion, the most feared Peacekeeper command carrier of its day, would not even be considered a military craft, but it’s Salis himself who makes the Nebari a truly unnerving presence. The episode briefly considers his perspective when he inquires of a suspicious Crichton, “You crippled our ship, endangered our lives, disrupted our plans; are you now the arbiter of our justice system, as well?” But it doesn’t take long for Salis to show his true (mostly gray) colors, as he calmly demands Rygel be turned over to Nebari custody and observes Zhaan could also benefit from mental cleansing. Salis and the race he represents aren’t scary because they can destroy the Zelbinion and wipe people’s minds; they are scary because they believe that they have the right to do so, and indeed, as Chiana angrily observes, that they are doing everyone else a favor when they make such decisions. Their morality doesn’t just allow them to tamper with people’s minds against the willing—it demands it. Building on Salis’ assessment of the situation, “Durka Returns” provides the clearest example yet of what will fast become a Farscape hallmark, as the travelers onboard Moya aren’t here to solve problems so much as fix problems of their own creation. There’s no reason to think that the mentally cleansed Durka is anything but sincere when he claims to be a changed man and rejects his earlier violence, which means Rygel is entirely responsible for unleashing the very monster he most fears. After his brief run as a beloved leader in “Jeremiah Crichton,” Rygel is back to being dismissed and insulted, which makes it slightly more understandable that he takes matters into his own hands and tries to blow up Durka. Then again, Crichton is standing right next to Durka when the bomb rolls in, and the pregnant Moya’s hangar bay is also put at risk. As such, any sympathy for Rygel from either the audience or his shipmates is short-lived, especially when Crichton snarls that he’s going to kill the Hynerian for this. Some of the viewer’s potential sympathy for Rygel is rooted in knowledge of science fiction tropes; on most other shows, it would be revealed that Durka is indeed faking his rehabilitation or some random accident would undo his conditioning. We know that Rygel will be proved right about Durka, or else there wouldn’t be much point to bringing him back in the first place, but the episode subverts expectations by turning Rygel’s fears into a self-fulfilling prophecy. After all, the ultimate point of “Durka Returns” is that the show’s most dangerous characters aren’t necessarily the obvious villains. At first, the episode seems to halfheartedly sell the misdirection that Chiana killed Salis as setup for Durka’s big reveal, but the episode’s final scene reveals the opposite might be true, that Durka’s return to villainy might have allowed Chiana to get away with murder. Crichton’s question to Chiana is shocking, not only because it calls into question Chiana’s innocence—she might not just be the rebellious but basically goodhearted victim of an oppressive society—but also because it reveals how much Crichton has learned from his time in this universe. His earlier suggestion to Chiana that she start trusting somebody shows his early idealism has been replaced with a harsher, more practical outlook, but it’s still stunning to see our hero casually accuse his apparent newest friend of murder. Chiana offers no denial, and Crichton gives no indication he will press the point, explaining that he owes her at least that much. It’s a morally complex, fiendishly ambiguous way to end the episode, and it’s the episode’s last, best indication that, the previous misfire notwithstanding, Farscape won’t just be all right. It’s going to be great. “Durka Returns” also gets some nice mileage out of pairing off unusual combinations of characters, in this case Aeryn and Rygel. The two have scenes that effectively bookend the episode, and Aeryn gets in a great last line when she points out that Rygel has just compared himself to a Peacekeeper. While Moya’s pregnancy has been a plot point before—dealing with it is basically the inciting incident for “Jeremiah Crichton,” after all—this episode captures just how troublesome it is on an ongoing basis, as the unexpected starburst leads to the near-collision with the Nebari ship. Lani Tupu is wonderfully tetchy as the clearly exhausted, overworked Pilot, who is having real trouble maintaining his usual calm demeanor. “Why do I always get stuck with the greebols that don't have any plan?” “No, no. I’ve got a plan. You’re just not going to like it.” If ever a single exchange summed up the character of John Crichton and Farscape in general, that’s as good a choice as any. Next week: We slow down to take a closer look at “A Human Reaction,” one of the first season’s best and most important episodes.